1970 saw us back in the Midlands, but time with a change of hire base and a change of direction. Our craft on this occasion was the Halcyon, another mid cockpit plywood cruiser which were all the rage at the time. We took the boat out from Stone in Staffordshire, so I suspect that means we hired from Canal Cruisers, one of the very first hire businesses on the system and one which is still in business today. 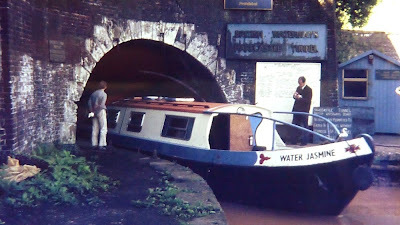 Our route took us up through the Harecastle Tunnel in the days before it's long closure and reconstruction, the time when so many tunnels were closed including the Blisworth, Wast Hill and also the Preston Brook (I think). I don't remember the steel doors or ventilation system which draws the air from north to south, so maybe these are later refinements. I do seem to remember that operations were mornings one way and afternoons the other, rather than the repeated switching we have today. The key thing was that Halcyon didn't have the fixed windscreen system present on Yorkanaught, which we had wanted to take through two years previously, and had a low enough air draft to let us pass - just. Although I was only ten at the time, I remember the low section clearly, where the roof came down so low we had to sit on the cockpit floor and steer by looking at the sides, there were a mere couple of inches above the cabin top. We then ventured up the Macclesfield, a shallow canal with margins full of rocks and coping stones which had been undermined by the wash of passing craft. It was on this stretch that we became aware of a major snag with Halcyon. The propshaft appears to have come straight from a blueprint supplied by the Ministry of Crap Design (this venerable Institution is still alive and kicking, adding peverse tweaks into almost any product you care to mention). You see, the propeller was stuck onto the end of the propshaft, which is a very sensible place for it to be. The problem was that the propshaft extended to about two feet from the stern gland and was completely unsupported. 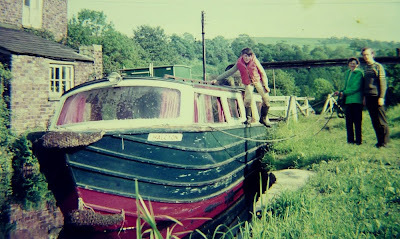 The rocks in the Macclesfield were the downfall of this craft and as we passed Congleton an underwater obstacle knocked the shaft out of true and set up a terrible vibration. We pressed on to Whaley Bridge from whence help was summoned. This resulted in a days delay, when the offending shaft was removed and a new one inserted aided and abetted by a boatyard worker immersed up to the neck in the cut. Its a good job it was the summer! This delay at Whaley Bridge gave me an opportiunity to explore the weeded up arm half a mile back down the canal. Although I didn't know it at the time, the junction I mooched around in was the entrance to Bugsworth Basin, and had I been a bit older and a bit bolder I could have gained access to the overgrown basins beyond which have recently been restored. The trip back took us through High Lane and by a strange twist of fate, past the back of the house which Dr D would buy just a few years later. It's strange the way these things happen, a bit like me ending up in Birmingham. The trip ended with a day or so to spare, which was used exploring the Caldon Canal. In those days there were bottle kilns a plenty and working ones too. How things change. Sorting these old boat trips into chronological order has been tricky in the absence of written records. However, as I appear in most sequences I have used my growing frame to order the record. This trip appears to mark the last time I wore life jacket.